The reason for improving and maintaining optimum soil structure is to optimise water, nutrient and air availability to vines by making the soil more porous, softer and more penetrable by roots. The spin off from this is usually more uniform vineyards that can be managed more easily with better control of berry ripening, improved productivity and berry quality and more assured sustainability. covering the soil surface at all times by growing perennial, fibrous-rooted cover crops controlled by mowing and/or herbicide application. the method and timing of application. Gypsum is a mineral: CaSO4-2H2O but it contains impurities. It is obtained either by mining or as a by-product of the manufacture of concentrated phosphate fertilisers and hydrofluoric acid. Gypsum quality depends on two factors, purity (impurities include water, soil, limestone, salt, fluoride, etc) and fineness. Ideally purity should be 14 to 16 % sulfur (S) and more than 80 % should pass through a 2 mm sieve. cracking clay soils with large, widely spaced cracks or which seal and crust after rainfall instead of self-mulching to form small (2 to 5 mm diameter) surface aggregates. For gypsum to act it has to dissolve in soil water. Dissolution rate is determined by how much rain or irrigation water passes through the soil. As a rule of thumb, between 100 and 500 mm (4 to 20 inches) of rain or uniformly distributed irrigation water will be required to dissolve 1 t/ha (900 lb/acre) of applied gypsum, depending on fineness and efficiency of incorporation. This means that application of 5 tonnes/ha (2 ton/acre) of gypsum could take as long as 3 years to dissolve completely. For this reason, in most situations, depending on soil conditions, it is not sensible to apply more than 5 to 10 tonnes of gypsum (2 to 4 tons) at a time. If more gypsum is required, establish an annual or biannual application program of 1 to 2 t/ha (0.5 to 1 ton/acre) of gypsum, spread on the soil surface in autumn (fall). Soils with poorly structured surface layers (crusted, hard set, compacted, erodible, cracking), should be dealt with in the same way. Winter rain will leach the gypsum into the soil. Gypsum can also be dissolved in irrigation water and applied through the irrigation system. This is an efficient means of application, but requires finely milled gypsum and specially designed equipment to mix the gypsum and water. Apply gypsum in autumn (fall) prior to winter rain, which will dissolve it and carry it to depth. Dissolution of large amounts is greatly aided by banding it on the deep rip line and ripping it into the soil. Some gypsum will be carried down mechanically but more importantly, rainwater following the preferential path of the rip line will dissolve it and move it to depth. Disking it in will also improve dissolution rate. penetration of rain and irrigation water is improved. These benefits will persist longer if gypsum is added to stabilise the newly created pores and heavy wheel traffic is rigorously excluded from the vicinity of the rip line. What soils should be deep ripped? waterlogged soil where a drainage barrier can be identified within a depth of 800 mm (32 inches) from the surface. The correct subsoil moisture content is critically important for effective deep ripping of clay-rich soils. Generally there are only two periods of the year when this condition can be met: late autumn (sufficient rainfall to moisten but not saturate subsoil) and late spring (sufficient drying out but not desiccation of subsoil). Only at these times will the soil fracture correctly and yield fine (<20 mm, < _ inch diameter) fragments necessary for optimum root penetration. At other times of the year soil moisture content is unlikely to be at a level for optimal results. In summer the subsoil is too dry and clay-rich soil shatters, creating large clods and fine dust. In winter soil remoulds and compacts because of the plasticity of wet clay. Sandy, gravelly and rocky soils are less critically dependent on water content because they tend to be fracture in a brittle way even when quite wet. If the subsoil rolls out into a thread that crumbles as it approaches a diameter of 3 mm (1/8 inch), the water content is correct for optimal results: tensile fracturing and maximum lift of the subsoil to yield small clods, the majority not bigger than about 20 mm (3/4 inch) diameter, and a minimum of fine dust. If the soil rolls into a thread smaller than 3 mm (1/8 inch) in diameter, the soil is too wet for optimal fracturing and the subsoil will not fracture laterally, the effect of ripping may be plastic failure leaving narrow slots with the main body of subsoil intact and deposition of large subsoil clods on the surface. If the subsoil cannot be worked into a ball that can be rolled into a thread or if a coarse thread forms that crumbles well before it reaches 3 mm (1/8 mm), the soil is too dry for ripping and the result will be brittle fracturing of the subsoil leaving many large clods in a matrix of fine dust. If gypsum is required for subsoil amelioration, broadcast half of the gypsum on the surface during the autumn prior to ripping. Winter rain will leach the gypsum into the soil, where, if it reaches the subsoil, a degree of softening can be expected, and a better ripping product achieved. If the soil is to be ripped in late spring, sow a cereal crop to stabilise the soil through winter and use the winter rainfall. This will provide the means to control soil wetness at the time of ripping in spring. If ripping is done in autumn, and a year’s lead in time is not available, apply up to 5 tonnes/ha (2 ton/acre) of the gypsum requirement on the rip line and rip the gypsum into the soil. If the gypsum requirement is over 5 tonnes/ha (2 ton/acre), broadcast the remainder onto the surface and work it in during subsequent vineyard preparation. proper lateral fracturing to give a wide (> 1 m, 40 inches) fractured zone at the soil surface. correct depth of ripping, (up to 1 m, 40 inches), depending on desired root zone volume and subsoil conditions. Do not proceed with ripping if all these factors are not correct. If necessary raise the ripper working depth and rip on the same lines more than once, going progressively deeper with each pass. Alternatively use a tandem of ripper blades with the rear blades spaced immediately behind the front ones but working deeper. The shape of the ripper blade is important for correct fracturing of subsoil material. Hard rock, weathered rock, and cemented pans require a wingless blade with a point having a rake angle of at least 20O. 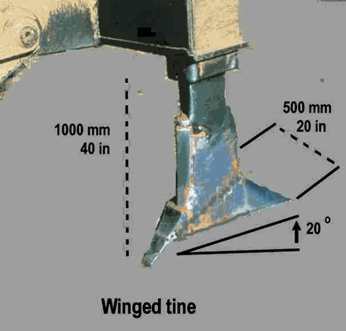 Clay subsoils require a winged blade (Figure 1) with a 90O point and angled at 20O for maximum lateral fracturing and maximum lift. The rake angle of 20O is critical. Tines with a greater rake angle will compact the soil adjacent to and below the rip line. Tines with angles less than 20O will not lift and shatter the subsoil. South African experience suggests that a series of 20O wings spaced down the ripper tine is effective in diffusing the boundaries of sharply layered soils ("Duplex" soils) without undue mixing of horizons. The latter needs to be avoided if deep material has an undesirable effect on shallower soil properties. Figure 1: Optimum dimensions and rake angle of a winged tine suitable for deep ripping clay and clay loam soils at the plastic limit moisture content. Direction of ripping and spacing of ripper tines depends on the aims of ripping and the depth and extent of fracturing required. For complete disruption of an impeding layer, the spacing of the tines must be 2/3 of the final depth of ripping. Ripping only on the row is a cost beneficial way of establishing vines but will probably not create conditions for lateral spread of the vine root system into the midrow. This may be an important consideration in vineyards where irrigation water is limited and reliance on rainfall storage great. Recompaction of vineyards is a common occurrence because of the need to traffic the midrow to prepare for planting, install trellis posts and subsequently manage the vineyard. Ripping on the row and rigorously avoiding trafficking the rip line provides an immediate optimum root environment for the young vine and leaves available the option of ripping wheel tracks after the vineyard is established. Closely spaced ripping may preclude trafficability of the vineyard for some time if wet conditions occur after ripping. Cross ripping at 90O may also create conditions of excessive soil wetness. In general, the direction of travel during ripping should be down slope to facilitate natural drainage. If cross ripping is necessary, excessive wetness can be reduced by cross ripping at 60O with the intersecting rip lines running down slope. avoid driving heavy machinery on the rip line. Immediately after deep ripping the surface soil should be prepared for sowing a cover crop and incorporating the remaining amendments, fertiliser and on-row organic matter. At this time secondary wheel compaction can be eliminated by using deep working tines behind the tractor wheels.. A set of tines (up to 300 mm, 12 inches deep) behind the wheels of heavy tractors wheel will prevent further compaction. Do not use of a rotary hoe to finish off land preparation, rather disking with the tractor wheels straddling the rip line. A cover crop should be sown immediately after ripping, particularly on steep land. Generally, a grass or cereal cover crop is ideal for controlling erosion and stabilising the beneficial soil structure created by ripping and tillage. The cover crop should be controlled by coarse mowing rather than fine slashing, to provide a durable surface mulch.